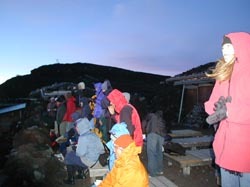 People in the study and report to climbing Mount Fuji in Japan. 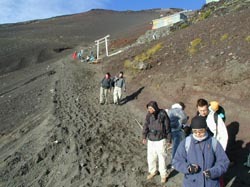 *HOME / People in the study and report to climbing Mount Fuji in Japan. quaint little restaurant and lodge. We got out and started walking around and I was merely admiring the rustic architecture, then I turned around and there it was Fuji-san. It was flanked my two other mountains and spotted with villages in the valleys. Fuji-san is not actually a very tall mountain (3776m), and its uniqueness is from its conical shape with exquisitely beautiful sloping sides. As with most excursions I take with Japanese friends, I have never completely clear on where we are going or when we will get there, so seeing Fuji-san was an actual surprise. I had no idea it was so near to Misaka and because of weather conditions in Tokyo the several times I have been there, until Tuesday I had not actually seen Fuji-san. For example, one man down the street from me plays a flute in his garden in the early hours of the morning, which is very nice to wake up to by the way. One morning on my way to school I stopped to look at a garden, then all of the sudden I saw him. He looked at me, when greeted each other and I continued my walk to school and he continued playing. This kind of thing happens all the time. If I take a walk around the grape vineyards and peach orchards at dusk, I am bound to run into one of these Grandfathers. I only wish I spoke enough Japanese to ask them about their lives and the things they have seen in the past 60 years of Japans history. For me at least, Fuji-san is like one of these grandfathers, who sit and watch what goes on around them. He listens and sees everything happening in Japan, he has seen more changes than the rest of us and is very wise, but he does not usually interrupt the goings on, for he knows that he can remind us of his presence anytime he wants. Even through all of the changes that happen to a culture over the centuries, particularly the amazing dichotomy of ancient and modern in Japan, Fuji-san reminds me of a Japan that has endured. When my students are unruly and loud during class and I hear them struggle to speak English in the many role-plays we do, it is very difficult to remember the Japanese culture I studied in history classes. However, when it is time to finish and I hear the class leader say "Kiotsuke" and the entire class stops and stands at attention, then the command for bow "Rei" and we both bow to each other ending class, I remember the courtly formality of my East Asia Civilization textbooks. When the kids do that, or I meet one of the grandfathers, it as though Fuji-san is surprising me with his presence again. 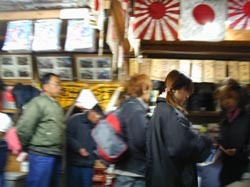 historical traditions will remind me of what I love about Japan and why I came here in the first place. this volcano has to be in winter. You know when it is covered in snow, but the weather is absolutely clear, with none of that summer haze getting in the way. Just when the sun is setting, you can see the most amazing colours glinting off its surface. It's breath taking, but unfortunately that's the way it should be left. Up close Fuji is pretty damn ugly. It's pretty much just a load of ash, rock and scree piled up in an interesting shape. Climbing it is difficult and goes on for what seems like forever, while coming down is harder and seems to last even longer. The view at the top is admittedly spectacular, but when its price is an 11 hour round trip with 2 hours of frigid windswept pain thrown in for good measure, you have to ask yourself if it's really worth it. I think it's probably just about worth doing it once, but only to say you've done it. That famous Japanese proverb is very accurate in that respect, but sadly I am indeed the fool who climbed twice. The first time was just one week after my initial arrival in Japan back in July 2000 and I guess I just got swept up in it all. Somehow, I forgot all the bad and when this summer's trip was announced I didn't want to be left out. afar. To be frank it requires less effort, takes less time and in any case the view of Fuji tops the view from Fuji by a country mile. After living in Fujiyoshida for three years, I found myself coming to sort of worship Mt Fuji myself, just as many Japanese people do. I found myself longing to climb her every summer, and spend time on her slopes hiking and biking. Even windsurfing on Lake Motosuko I was always awed by the sight of Mt Fuji! So one thing that never understood is why there is an artillery range on the very slopes of sacred Mt Fuji. Of course, no one wants an artillery range near their house, but it seems particularly strange that artillery is fired right at the sacred symbol of Japan. cans and bottles at any and every COMBINI...? Fuji-san the whole climb seemed to be pretty brutal, but I also think I went about it all wrong I wanted to get to top as fast as I could and had been told that it is an easy climb. It is not, and I felt like I was punished by the mountain for trying to conquer it. The cold was brutal I had expected shelter, warmth, cold beers and a nap none of which I received my expectations crushed, no party at the top, the wind, etc. All made the sunrise that much more beautiful. On Friday night 5th September, me and about 19 other ALTs gathered around Mt. Fuji and began our long overnight climb. The weather was brilliant - dry and clear. We started around 9pm and stepped carefully up the rocky paths guided by our flashlights. We took oxygen canisters with us but there were no nauseous casualties! 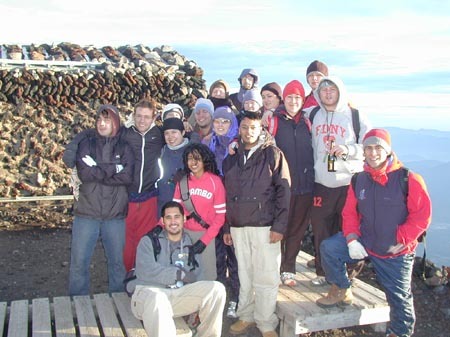 Although we started together, by the end most of us had split in to little groups, climbing in pairs and congregating at the various stations or huts along the top. Luckily, me and a few others enjoyed the rests at these huts and timed our ascent well, as we reached summit at 4am,about 7hrs after starting. Other adventurous lots got to the top by 1.30am but froze cold under Mars [very visible and red here Japan the Moon, and the millions of stars I have never seen before in my life! Hundreds and thousands shimmering in all sorts of patterns! When we reached the top, we stood around gathered anxiously by the edge of the Mountain brim in wait for Sunrise. Looking very angry, the sky blazed a bright fiery orange at first, then a cool purple blue and finally a pretty lilac pink! It warmed up quickly as the sky changed colours. At around about 5.30 am we explored the huge crater where fresh lava is expected to erupt in the next few years, and took lots of photos that you would normally expect to find on postcards. Then down. How mundane and dirty. Boring zig-zagging down, down, down yet never reaching the bottom. So monotonous. Red sand spraying as we skidded and stumbled along. By 9.30 we reached Station 5 again where we collapsed and baked in the contrasting heat and longed for showers and sleep.